An example of a plasma display. A plasma display panel (PDP) is a type of flat panel display often used for large television displays (typically above 37 inches or 940 millimeters (mm)). Many tiny cells located between two panels of glass hold an inert mixture of noble gases (neon and xenon). The gas in the cells is electrically turned into a plasma, which then excites phosphors to emit light. Plasma displays should not be confused with LCDs (liquid crystal displays), which are also lightweight, flat screen displays but are produced by a very different technology. Plasma display technology offers the advantages of producing displays with large, very thin screens and bright images with wide viewing angles. With the advent of "seamless" plasma display technology, it has become possible to display more than one image on the video wall simultaneously, to adjust color balance, and to switch between contents from multiple inputs in the video wall. 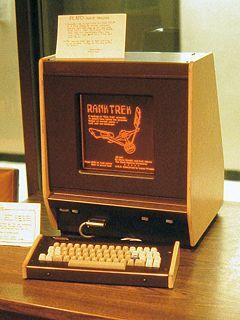 Plasma displays were first used in PLATO computer terminals. This PLATO V model illustrates the display's monochromatic orange glow as seen in 1981. The plasma video display was co-invented in 1964 at the University of Illinois at Urbana-Champaign by Donald Bitzer, H. Gene Slottow, and graduate student Robert Willson for the PLATO Computer System. The original monochrome (orange, green, yellow) video display panels were very popular in the early 1970s because they were rugged and needed neither memory nor circuitry to refresh the images. This was followed by a long period of sales decline in the late 1970s, as semiconductor memory made CRT displays cheaper than plasma displays. Nonetheless, the relatively large screen size and thin body of plasma displays made them suitable for high-profile placement in lobbies and stock exchanges. In 1983, IBM introduced a 19-inch (48-cm) orange-on-black monochrome display (model 3290 'information panel'), which was able to show four simultaneous IBM 3270 virtual machine (VM) terminal sessions. That factory was transferred in 1987 to startup company Plasmaco, which was founded by Dr. Larry F. Weber (one of Dr. Bitzer's students) with Stephen Globus and James Kehoe (who was the IBM plant manager). In 1992, Fujitsu introduced the world's first 21-inch (53-cm) full-color display. It was a hybrid, based on the plasma display created at the University of Illinois at Urbana-Champaign and the Science & Technical Research Laboratories (STRL) of Japan Broadcasting Corporation (NHK), achieving superior brightness. In 1996, Matsushita Electrical Industries (Panasonic) purchased Plasmaco, its color AC technology, and its American factory. In 1997, Fujitsu introduced the first 42-inch (107-cm) plasma display. It had a resolution of 852x480 and was progressively scanned. Also in 1997, Pioneer started selling the first plasma television to the public. Many current plasma televisions, thinner and of larger area than their predecessors, are in use. Their thin size allows them to compete with large projection screens. Since then, plasma displays have become thinner and larger in screen size. The largest plasma video display in the world at the 2008 Consumer Electronics Show in Las Vegas, Nevada, USA, was a 150-inch (381 cm) unit manufactured by Matsushita Electrical Industries (Panasonic) standing six ft (180 cm) tall by 11 ft (330 cm) wide and expected to initially retail at US$150,000. 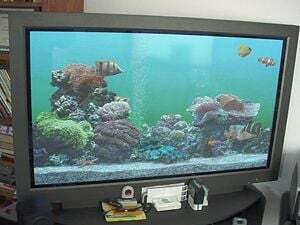 Until quite recently, the superior brightness, faster response time, greater color spectrum, and wider viewing angle of color plasma video displays, when compared with LCD (liquid crystal display) televisions, made them one of the most popular forms of display for HDTV (high-definition television) flat panel displays. For a long time, it was widely believed that LCD technology was suited only for smaller sized televisions and could not compete with plasma technology at larger sizes, particularly 40 inches (100 cm) and above. Since then, improvements in LCD technology have narrowed the technological gap. The lower weight, falling prices, higher available resolution (important for HDTV), and often lower electrical power consumption of LCDs make them competitive with plasma television sets. In late 2006, analysts noted that LCDs were overtaking plasmas, particularly in the important 40-inch (1.0 m) and above segment, where plasmas had previously enjoyed strong dominance. The industry has also been trending toward the consolidation of manufacturers of plasma displays, with around fifty brands available but only five manufacturers. In the first quarter of 2008, a comparison of worldwide TV sales broke down to 22.1 million for CRT, 21.1 million for LCD, 2.8 million for plasma, and 124 thousand for rear-projection. In an effort to compete with smaller LCD panels in the market, Vizio released the VP322, a 32" plasma television, in May 2008. This display uses a 32-inch panel made by LG and has a contrast ratio of 30,000:1. Plasma displays are bright (1000 lux or higher for the module), have a wide color gamut, and can be produced in fairly large sizes, up to 381 cm (150 inches) diagonally. They have a very low-luminance "dark-room" black level, compared to the lighter gray of the non-illuminated parts of an LCD screen. The display panel is only about six cm (2.5 inches) thick, while the total thickness, including electronics, is less than ten cm (four inches). Plasma displays use as much power per square meter as a CRT or an AMLCD television. However, power consumption varies greatly with picture content, as bright scenes draw significantly more power than darker ones. Nominal power rating is typically 400 watts for a 50-inch (127-cm) screen. Post-2006 models consume 220 to 310 watts for a 50-inch (127 cm) display when set to cinema mode. Most screens are set to 'shop' mode by default, which draws at least twice the power (around 500-700 watts) of a 'home' setting of less extreme brightness. The lifetime of the latest generation of plasma displays is estimated at 60,000 hours of actual display time, or 27 years at six hours per day. This is the estimated time over which maximum picture brightness degrades to half the original value, not catastrophic failure. Competing displays include the CRT (cathode ray tube), OLED (organic light-emitting diode), AMLCD (active-matrix liquid crystal display), DLP (Digital Light Processing), SED-tv (surface-conduction electron-emitter display), and field emission flat panel displays. The main advantages of plasma display technology are that it can produce a large, very thin screen, and the image is very bright and has a wide viewing angle. Composition of a plasma display panel. The xenon and neon gas mixture in a plasma television is contained in hundreds of thousands of tiny cells positioned between two plates of glass. Long electrodes are also sandwiched between the glass plates, in front of and behind the cells. The address electrodes sit behind the cells, along the rear glass plate. 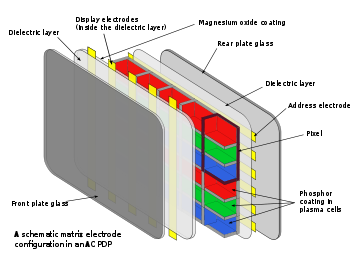 The transparent display electrodes, which are surrounded by an insulating dielectric material and covered by a magnesium oxide protective layer, are mounted in front of the cell, along the front glass plate. Control circuitry charges the electrodes that cross paths at a cell, creating a voltage difference between front and back and causing the gas to ionize and form a plasma. As the ions rush to the electrodes and collide, photons of light are emitted. In a monochrome plasma panel, the ionizing state can be maintained by applying low-level voltage between all horizontal and vertical electrodes, even after the ionizing voltage is removed. To erase a cell, all voltage is removed from a pair of electrodes. This type of panel has inherent memory and does not use phosphors. A small amount of nitrogen is added to the neon to increase hysteresis. In color panels, the back of each cell is coated with a phosphor. Ultraviolet photons emitted by the plasma excite these phosphors to give off colored light. The operation of each cell is thus comparable to that of a fluorescent lamp. Every pixel is made up of three separate subpixel cells, each with different colored phosphors. One subpixel has a red light phosphor, another has a green light phosphor, and a third has a blue light phosphor. These colors blend together to create the overall color of the pixel, analogous to the "triad" of a shadow-mask CRT. By varying the pulses of current flowing through the different cells thousands of times per second, the control system can increase or decrease the intensity of each subpixel color to create billions of different combinations of red, green and blue. In this way, the control system can produce most of the visible colors. Plasma displays use the same phosphors as CRTs, which accounts for the extremely accurate color reproduction. Contrast ratio is the difference between the brightest and darkest parts of an image, measured in discrete steps at any given moment. Generally, the higher the contrast ratio, the more realistic the image is. Contrast ratios for plasma displays are often advertised as high as 30,000:1. On the surface, this is a significant advantage of plasma over display technologies other than OLED. Although there are no industry-wide guidelines for reporting contrast ratio, most manufacturers follow either the ANSI standard or perform a full-on-full-off test. The ANSI standard uses a checkered test pattern whereby the darkest blacks and the lightest whites are simultaneously measured, yielding the most accurate "real-world" ratings. By contrast, a full-on-full-off test measures the ratio using a pure black screen and a pure white screen, which gives higher values but does not represent a typical viewing scenario. Manufacturers can further improve the reported contrast ratio by increasing the contrast and brightness settings to achieve the highest test values. However, a contrast ratio generated by this method is misleading, as the image would be essentially unwatchable at such settings. Plasma displays are often cited as having better black levels (and contrast ratios), although both plasma and LCD have their own technological challenges. Each cell on a plasma display has to be precharged before it is due to be illuminated (otherwise the cell would not respond quickly enough) and this precharging means the cells cannot achieve a true black. Some manufacturers have worked hard to reduce the precharge and the associated background glow, to the point where black levels on modern plasmas are starting to rival those of CRT. With LCD technology, black pixels are generated by a light polarization method and are unable to completely block the underlying backlight. 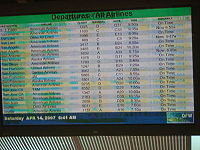 An example of a plasma display that has suffered severe burn-in from stationary text. With phosphor-based electronic displays (including cathode-ray and plasma displays), the prolonged display of a menu bar or other graphical elements can create a permanent ghost-like image of these objects. It happens because the phosphor compounds that emit the light lose their luminosity with use. As a result, when certain areas of the display are used more frequently than others, over time the lower luminosity areas become visible to the naked eye, and the result is called burn-in. Although a ghost image is the most noticeable effect, a more common result is that the image quality continuously and gradually declines as luminosity variations develop over time, resulting in a "muddy" image. Plasma displays also exhibit another image retention issue that is sometimes confused with burn-in damage. In this mode, when a group of pixels are run at high brightness (when displaying white, for example) for an extended period of time, a charge build-up in the pixel structure occurs and a ghost image can be seen. However, unlike burn-in, this charge build-up is transient and self corrects after the display has been powered off for a sufficiently long period of time, or after running random broadcast TV-type content. Over time, plasma display manufacturers have managed to devise ways of reducing the problems of image retention with solutions involving what are known as gray pillarboxes, pixel orbiters, and image washing routines. Seamless plasma displays have appeared in an effort to address the need of consumers for large plasma screens. Traditional plasma displays are characterized by a thick bezel surrounding the screen, but the new, seamless plasma displays offer small (four to seven mm) gaps in video walls. This technology allows constructing video walls of multiple plasma panels tiled together contiguously to form one large screen. Unlike traditional plasma displays, seamless plasma panels must be used along with a control software system. This system makes it possible to display single or multiple images on the video wall at one time, to switch between content from multiple inputs, and to adjust color balance in the video wall. ↑ The History of Plasma Display Panels. Plasma TV Science. Retrieved June 21, 2008. ↑ Digital TV Tech Notes, Issue #4 Tech Notes. Retrieved June 21, 2008. ↑ E. Dugan, 2008, 6ft by 150 inches: measuring up to the world's biggest plasma TV Independent.co.uk online edition. Retrieved June 21, 2008. ↑ G. Hora, 2008, Panasonic's 150-inch Plasma to Cost $150,000 CoolTechZone.com. Retrieved June 21, 2008. ↑ Reuters, 2006, Shift to large LCD TVs over plasma MSNBC. Retrieved June 21, 2008. ↑ 2008, LCD televisions outsell plasma 8 to 1 worldwide Digital Home Canada. Retrieved June 21, 2008. ↑ VP322 32" Class Plasma HDTV Vizio Inc. Retrieved June 21, 2008. How Plasma Displays Work HowStuffWorks. Hutchinson, Jamie. 2003. Plasma display panels: The colorful history of an Illinois technology ECE ILLINOIS Electrical and Computer Engineering Alumni News, Winter 2002-2003. History of "Plasma display panel"
This page was last modified on 29 March 2019, at 21:02.